We've seen many a drone at CES 2018 this week, but few as compact and ingenious as the AEE Selfly drone, which can collapse down, Transformer-style, into a phone case. That means it'll both snap your group shots and give your Android phone or iPhone some extra protection when it's not flying around. Despite its diminutive size, the specs are actually fairly decent: a camera capable of taking 13MP stills and 1080p videos, a 4-minute flying time between charges, and a range of around 45 feet or 13.7 meters. And it looks the part too – the metal-finished version being shown around the booths of CES is more stylish than the original plastic edition shown above. The original design is from the initial Selfly Indiegogo campaign, which it would appear has attracted the attention of China's AEE Aviation Technology to help produce the new-look model. 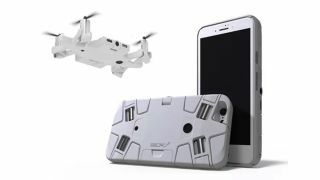 According to its makers, the folded down drone case can fit most smartphones between the sizes of 4 and 6 inches, and will work with the iPhone 6, 7, 8 and Plus sizes, as well as the Samsung Galaxy 8 and Galaxy 8 Plus. Flight is controlled by the accompanying smartphone app – there's no kind of intelligent selfie-spotting going on here – but the contraption can hover in position so you and your buddies can strike a pose before hitting the camera shutter button. The drone is going on sale in the first quarter of 2018 for a recommended retail price of $130 (around £95/AU$165), and you'll be able to pick it up from Amazon, among other places. You get both a battery and a spare with the drone case to get you started.